Every now and then someone comes along and transforms our life forever. It just seems to happen–as if we were sitting there, every day, waiting for our life to be changed. Even if we are good people, I think, we find ourselves still searching for that transformative Spirit incarnate in a person just waiting to jump out and find us where we are. In today’s Gospel, Jesus seems to change his mind and gives us one of the most beautiful passages in the New Testament. The story is unique: not only is it the only day of the year we hear about the Samaritan in the Roman Catholic liturgical cycle, but John’s Gospel is the only one to mention the story. There is no other text that ever mentions this woman, and her conversation with Jesus. Because of this, some people are quick to interpret the passage as a mainly metaphorical passage that moves along John’s Gospel narrative by showing Jesus as the new bridegroom (note the Jacob’s well reference to Genesis 29) and the woman as representing all of us as the new bride. Indeed, one could argue that the rest of the readings for today’s liturgy push us to interpret the Gospel text in this way. I will not be interpreting the text in such a manner today–a manner that leaves the woman nearly erased from history, erased from the narrative, just another tool for a larger story replete with references to Jacob and discussions of eternal life. The original hearers of John’s Gospel (read aloud, like anything back then) would not have been highly educated…they, like us, would have been drawn in by the stories of the Gospel, not the overall themes and literary devices. And, like any good evangelist, the author of John’s Gospel loves to tell good stories. The scene is set straight out of a script. Jesus is tired (3), and sits down by a well to have a drink (6). His disciples had gone into town to buy food (8), solid proof that Jesus knowingly participated in an unjust market economy (I haven’t looked into this, but how often do the Gospels mention Jesus buying something? Not very often). So Jesus is alone, and sees a woman coming to draw her own water. 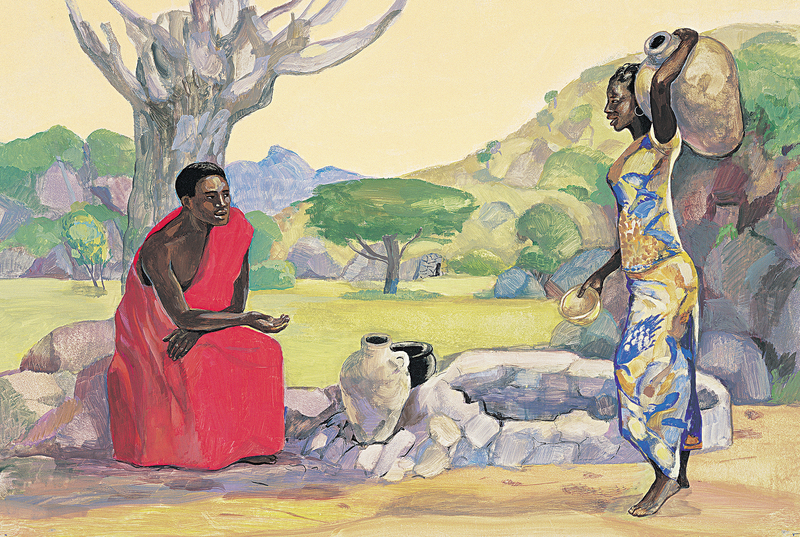 The narrator tells us that it was around noon, so it was odd to see someone coming to get water at this time–like any village with limited water supplies, people would draw enough water from the well at the beginning of a day to last them into the evening. Like the image above shows, the water would be carried in large containers, and would be quite heavy (thus the whole once-a-day idea). Because so many people would do this, the well would be a lively place of discussion and gathering at the start of every day. In short, drawing water at noon is a strange act, and a sign of isolation from the community. Yet here she comes, and a man, sitting by the well, asks her for a drink (7). His accent must give him away, because she fires back, “Excuse me? Are you talking to me?” And their verbal sparring begins. J: Give me some water! SW: (Confused) What? I’m a Samaritan woman, you’re a Jew from Jerusalem. Are you sure? SW: (Noting that this guy is obviously nuts) Oh so you’re greater than Jacob, the founder of Israel, whose well this is, is that it? J: You come here every day, you get thirsty every day. I have water that gives eternal life. SW: Oh, you’re right, I hate coming here to get water. Please, please, give me some of yours. J: Go get your husband and come back. SW: I don’t have one. J: You’re right, you’ve had five and you’re living with someone who’s not your husband. SW: Ok, you’re a prophet! This is different now! Can you talk about the Temple? The discussion continues, and the woman hears Jesus talk more about eternal life and, eventually, that he is the one for whom she has been waiting. A mildly ironic point, since he has just waited for her to come get water. Ok, no, that’s actually the precise opposite of what the text says, which I find interesting. The author really makes pains to let us know that the disciples are NOT misogynists: “They were astonished that he was speaking with a woman, but no one said, ‘What do you want?’ or, ‘Why are you speaking with her?’” (27) If we ever needed proof that Jesus lived in a partiarchal, misogynistic society where even his disciples would be expected to be misogynists, this is it. The author of the gospel tells us precisely what phrases the disciples were NOT saying, because, God knows, everyone listening to the Gospel in the 1st and 2nd centuries were thinking those lines, and would have fully expected the disciples to be saying them! The woman acts as Jesus’ voice, his apostle, if you will, and helps Jesus bring an entire town to realize the truth of the coming of the Messiah. In the end, the Gospel relates, the townspeople believed no longer just because of her word, but because of Jesus’ words to them. In the Roman Catholic tradition, the story generally ends here. But in the Eastern Orthodox tradition, the story continues, and the woman gets a name: Photini, or, the Enlightened One. She has a rich history and was deemed a saint and martyr (after she converted her 5 sisters and 2 daughters). She is named “Equal-to-the-Apostles” by the Orthodox Church, and stands as an example of one who brought Christ without question to the world. So, that’s awesome, and it brings us nearly to the end of our story, and the end of the Gospel story. Jesus is definitely super-mysterious in this tale. Does he ever actually drink water or eat any food? The Gospel leaves us guessing (31). And if he didn’t, does that mean that the whole event was set up to talk to this woman, to preach to her, and to let her preach in turn? Finally, what does this story say about Jesus’ method of evangelization? The woman doesn’t buy his remarks at the beginning, so he tells her about her life/reads her mind, and she begins to believe. I still don’t know what to make of this. It can’t be a handout for us to mimic–I’ve always been terrible at guessing people’s hidden secrets–so it must be something else. And, since I’m giving the story-as-is the benefit of the doubt, I’m going to give Jesus, in his full humanity, a human tale to end my reflection. Perhaps all of this was unplanned. Perhaps Jesus really did just want some water, and had the woman agreed–as most women would have, given men’s role in society–he would have taken some water from her and then eaten when his disciples had come back. Perhaps we would have never heard the story, and the whole thing wouldn’t have happened…..except the woman didn’t give Jesus his water. She didn’t listen to him. She bantered, she argued, she fought. A lot like the Syro-phoenician woman of Mark 7 or Matthew 15, honestly. Jesus tells her, literally, “it isn’t good to take the bread from children and throw it to the dogs” and she responds, “even the dogs eat the scraps from under the table.” Boom. Jesus relents, and heals her daughter. God’s mercy, she seems to argue, overflows like children eating messily at the table. So what did Jesus do for the Samaritan woman who openly disobeyed the rules of her society, who showed strength and faith and…sarcasm? He respected her, told her who he was and why he was here, and made her an apostle–one who was sent out to preach to the world. 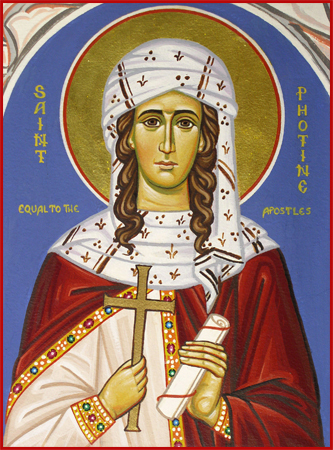 St. Photini, pray for us.